"Transportation leader specializing in serving North India"
K.S Tours is the premier transportation leader specializing in serving North India. K.S Tours was founded by Chanderveer Singh, in 2000, through his passion for providing superior customer service and his dedication to a lifelong dream of entrepreneurial fortitude. His complete enthusiasm to the utmost in customer experience brought forth K.S Tours company slogan - "Fun like never before." Since 2000, K.S Tours has managed one of the largest chauffeured fleets based in Jodhpur (Rajasthan) and provided high quality service. Focusing on our green efforts and offering North India Tours, Corporate and Group Travel, and Airport Transportation, we go beyond the expectations of our clients. Our Chauffeurs are highly trained guides providing you with superior and professional service. Once you experience K.S Tours, you will know you made the right decision. We guarantee your satisfaction. K.S Tours has grown from a two vehicle service to a full service North Indian executive ground transportation company, providing transportation for a vast array of clientele, utilizing every type of vehicle available to our industry. K.S Tours has become one of the most innovative livery companies in the industry, catering to our clients every need. K.S Tours continues to update its operations with the latest technologies, vehicles, and dedicated employees to assure each and every client our continued "Fun like never before." Successfully run Travel Desk at Novotel The Ummeid,Jodhpur. Providing services to International Tour Companies Like Natural Mystics, Ven Tours, Thomas Cook etc. Providing services to Suzlon Energy Ltd, Jet airways , Kingfisher Airlines etc. 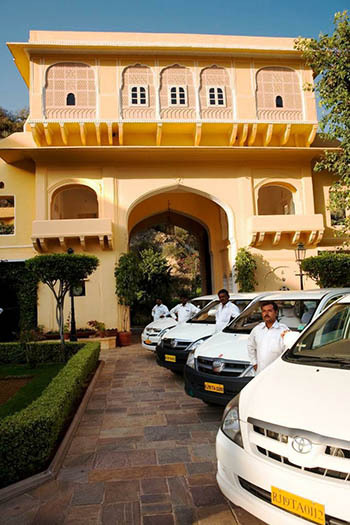 Here are some of the reasons that makes us leading private car rental company in Rajasthan. The K.S Tours has been, and will always be, dedicated to providing the greatest customer service and experience in the entire livery industry. This is accomplished through their commitment to creating, developing, and implementing a systemized way of operating, training, and servicing their clientele. At KS Tours, we work hard to ensure we find you the most exciting, intriguing and amazing destinations and experiences that work within your budget. As experienced professionals, we know how much goes into planning a trip. We will help you with the important and often over-looked details such as , documentation and recommendations etc. The K.S Tours philosophy is to hire dedicated customer service driven employees, chauffeurs, supervisors, and managers and respect each and every one of them as they expect their clients to be respected. Through this philosophy, K.S Tours is honoured to employ the most dedicated customer service driven staff in the entire livery industry, which our clients truly appreciate. KS Tours can organize the kind of car that you wish and give guarantee for experienced drivers and reliable arrangements for the start and end of your drive. Get all the latest news and trends related to Rajasthan.